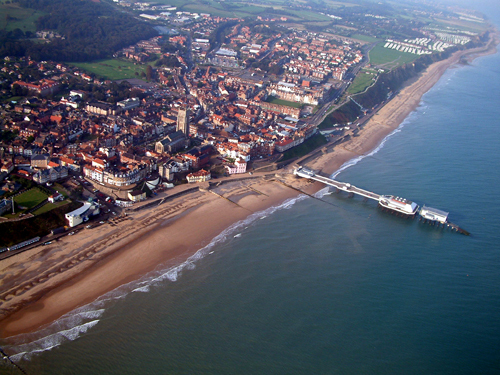 Our third set of pictures of Cromer from the air were taken on 11th October 2005, from an early morning flight to catch the sun shining on the cliffs. As we've already mentioned on the other pages with aerial pictures the book A Dictionary of Cromer and Overstrand History endeavours to help with the dating of photos and pictures by providing key pictures for comparison. Between 2001 and 2005 there were some signicant changes to buildings because of the Regeneration programme. There was significant funding to deal with some properties in town that were in a somewhat dilapidated state but there were also some new buldings. The Rocket House building on the sea front is one of the most obvious. The Cromer seafront is a pleasant mixture of building styles from a number of eras; whilst pictures in the book illustrate there was little standing in 1800, the following decades all provided their own features. The previous Rocket House was a functional building constructed on a bomb site after the Second World War; co-operation between the RNLI and the District Council resulted in a building that now houses the very successful Henry Blogg Lifeboat Museum and a caf� that is very well patronised all the year round. On the pier, the shops and bar extension to the pavilion are distinctive whilst the original open deck of the late Victorian construction has been restored - the amusement arcade seen in the 1981 pictures was blown off in a storm. In Suffield Park the 1933 hospital can be seen; this view changed in the course of new building in 2010 and 2011. The current district council offics are prominent on the hill to the south-west of the town whilst Cromer Hall nestles in the shadow of its woods.